...because VEX is a complete classroom solution. We believe that teamwork-driven learning environments are the key to expanding STEM education worldwide. Introducing students to STEM, one classroom at a time. ...because we're "robotics people", just like you. All questions regarding VEX parts or competitions on the official forum are personally answered by VEX staff. We love engaging with customers on social media and consider our vibrant community one of VEX's strongest assets. Meet our community of experts and join the conversation today at www.vexforum.com! ...because industry-leading technology can come in an accessible package. We know beginners want a low entry barrier, while experienced users need room to grow. VEX EDR robots are driven (literally) by cutting-edge technology adapted by our experts specifically for education. The VEX ARM® Cortex®-based Microcontroller acts as the robot "brain", allowing for both autonomous and driver control of robots. 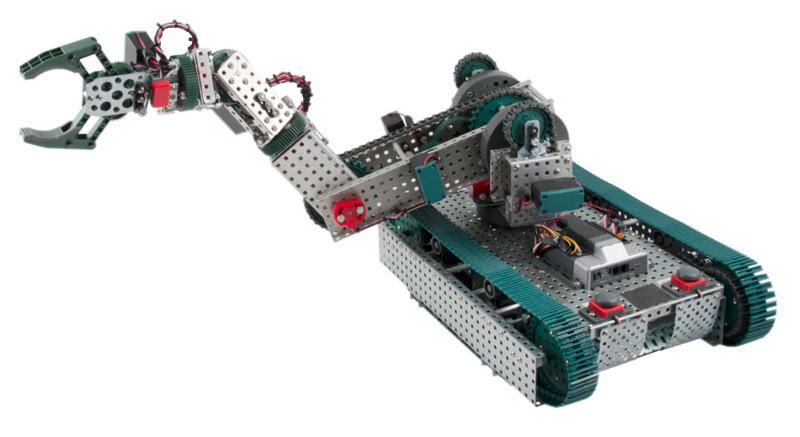 VEX EDR robots can also bring code to life when programmed using a software solution like ROBOTC (included in ALL VEX kits). This microcontroller also includes VEXnet wireless communication, enabling remote control using up to two VEXnet Joysticks. Whether you're building your first robot or outfitting a school, there's a solution for you. The all-encompassing Classroom Bundle can engage up to 36 students and includes a classroom competition field! ...because there's nothing quite like the thrill of competition. From the classroom to the world stage - students are learning STEM concepts without even realizing it! The VEX Robotics Competition, presented by the Robotics Education & Competition Foundation, is the largest & fastest-growing educational robotics competition for middle school through college-aged students in the world. Each year, an exciting engineering challenge is presented in the form of a game. Students, with guidance from their teachers and mentors, build innovative robots and compete year-round in a variety of match types. The 2016-2017 season saw over 11,400 teams from more than 40 countries take the field, a number that continues to rise every year.